We heard today that we have been nominated for an incredible four European Search Awards thanks to some of the successful campaigns we have produced. 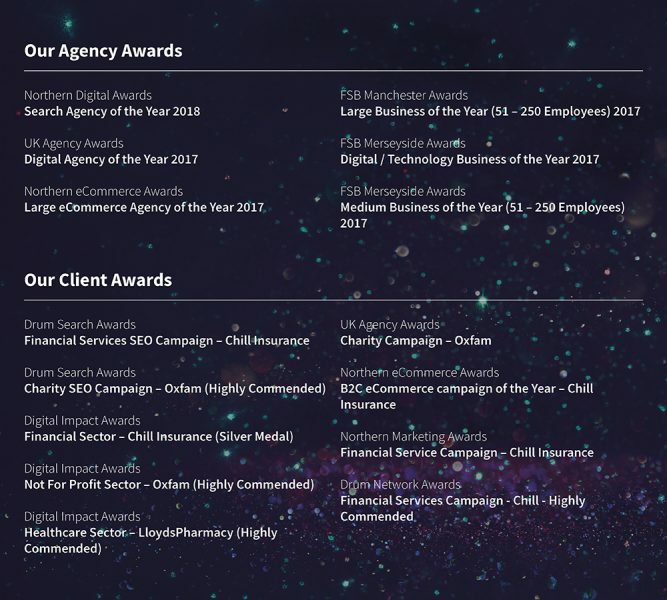 Click has been shortlisted for not only three Best SEO Campaigns for Kwik Fit, HomeLet and Chill Insurance but also the top honour of the night, Best Large SEO Agency. Speaking about the shortlist, Click Consult CEO and Founder, Matt Bullas said: “To add to our successes at home we are delighted to be shortlisted for four awards at the European Search awards. “The evening will be a great chance for us to join some of the continents best search marketers and confirms our standing as the UK’s leading search marketing agency. “This really is an occasion to showcase the cream of the crop and we are thrilled that we are not only nominated for an agency award but for three campaigns that we produced for our clients. “It’s fantastic that so many brands put their trust in us and we are pleased that the results delivered are worthy of such accolades. This is a real team effort and I’d like to say a personal ‘well done’ to all involved and offer my best wishes to all those nominated. The winners will be announced in Prague, Czech Republic on Wednesday 16 May 2018. Longer meta descriptions: How can you benefit on the SERPs? While it’s possible to debate the importance of virtually any other ranking factor, what has been found time and again is that links are the most important of all – don’t leave your link profile to chance.